The CRPF alleged that the state police was not letting them do their job. "Madhya Pradesh Police is not letting us work and abusing us. We're only following orders. We have been asked to not let anybody in," a CRPF official told reporters. However, the state police said they were responding to emergency calls from within the residential complex. "There are people inside who need medical assistance; they are calling the local SHO for help. They have closed the entire complex because of raid," senior police officer Bhupinder Singh said. Former Madhya Pradesh Chief Minister Shivraj Singh Chouhan also weighed in on the exchange calling it "an attempt to save corrupts" by the state government. "Income Tax department is doing its work, it's their constitutional right. CRPF soldiers were on duty, they were being stopped; MP Police clashed with CRPF. What Mamata (Banerjee) did in Bengal, the same game is being played in Madhya Pradesh," he said. 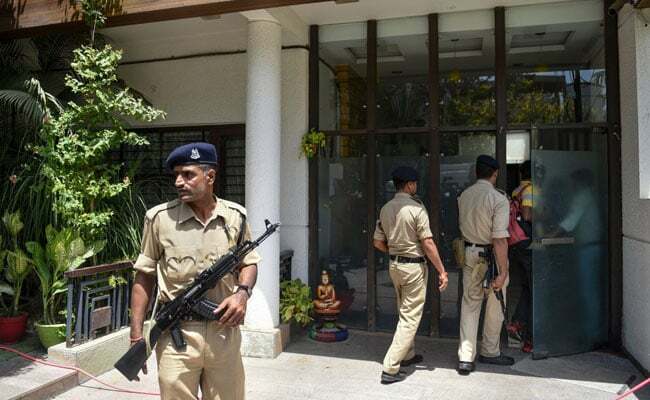 In Bhopal, the home of Ashwin Sharma, an associate of Praveen Kakkar, Mr Nath's former private secretary was being searched by a team of tax officials who had roped in the CRPF personnel for the multi-location raid. However, asked about his connection with the Chief Minister, Mr Sharma on Sunday morning said he is "a BJP man", news agency PTI reported. Tax officials targeted homes of Mr Kakkar in Indore and Mr Nath's former advisor Rajendra Kumar Miglani in Delhi. Rs 9 crore has been found, and some 50 places were raided in south Delhi's Green Park, Indore and Bhopal, according to sources. A total of 200 tax officers are involved in the raids. Mr Kakkar's home in Indore was also targeted in the raid by a team of over 15 income tax officers. Opposition parties have accused the Narendra Modi government of using enforcement agencies, such as the Income tax department against its political rivals to intimidate them and deter them from contesting elections. In a letter to investigation agencies, the Election commission today said that pre-poll raids remain politically neutral and mandated that its officials must be informed of such raids in advance.